“Knowing who you are” is one of the main themes of the week. 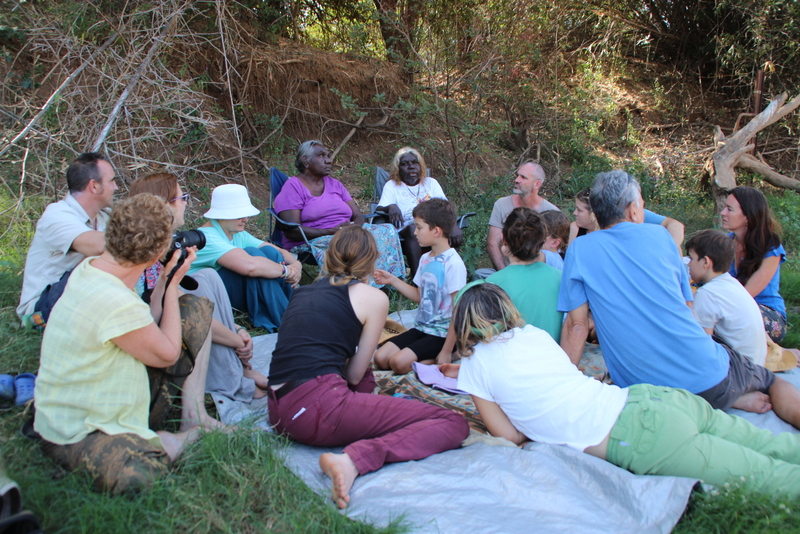 As Miriam and the other elders initiate the group into some traditional Aboriginal culture, they emphasise how important it is that their young people grow up with a firm grasp of their place in the order of things. One of the highlights is a demonstration of traditional dancing. Children from the local school gather excitedly, dressed in red loincloths and with faces, body and legs smeared with white ochre. They perform dance they only recently learned, faces wide with grins and clearly enjoying themselves. A group of men, also painted, provide music and rhythm on clapsticks and didge and members of the community gather to watch, whooping and clapping their appreciation. “There hadn’t been any dancing for the last 15 years and I’m starting to do this for the young ones”, says Miriam. 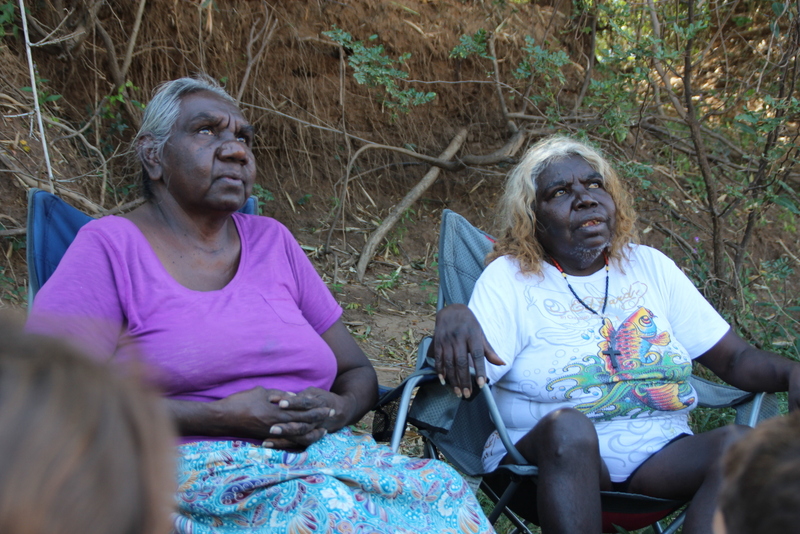 The Tour group also takes part in a welcome ceremony, something the Aboriginal people have done for centuries to alert the ancestors to the presence of strangers. “We let them know we have visitors, “ explains Miriam, “And ask they might have safe passage through our country.” Despite the stories people love to tell about crocodiles who live in the river, two community members wade into the shallows and one by one, we line up to receive a sprinkle river water onto our heads. This, it is said, carries the scent of each person to mingle with the water, so that part of us is now immersed in the nature of the place. Art, too, is a commodity understood by the community. The Merrepen Arts Centre, established on the community over 25 years ago and now a thriving social enterprise, is known all over Australia for its quality art work. This career path is being opened to the young people and an art sale set up by the school, children exhibit paintings accompanied by a professional-looking certificate of authenticity with an artist bio for each of them. The paintings, of turtles, lizards, waterlilies and butterflies, reflect the local landscape and and are well worth the $10-20 dollar price tags. 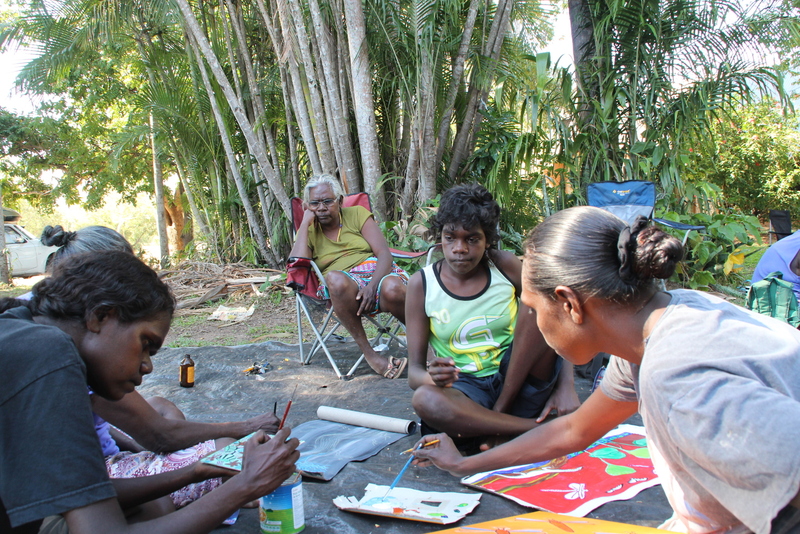 Between the art and the tours, Aboriginal communities like this are striving to overcome the difficulties associated not only with their remote location, but with poor health and high rates of suicide, particularly amongst the young. Kristy Pursch, a Tour participant and descendent of the Butchulla trible of Fraser Island, grew up estranged from her culture and although she now works on health projects in Aboriginal communities, saw the Cultural Connections Tour as a way to deepen her understanding of and connection to, Aboriginal people. Kristy has heard the call of the elders for support for their young people and has arranged to take a young student from the community on a Homestay with her own family back in Coff’s Harbour. On her return from the trip, Kristy wrote down some of her impressions, which I quote here without editing. It seems to me to be a fitting tribute to the elders who so kindly welcomed the Cultural Connections Tour group into their lives. “A quietness and completeness. Born of love and acceptance. To sit in the inner stillness of my being. And trust all as it should be. My old ones guide and love me. And will support me to mother my babies as they… Create their own identity.” Kristy Pursch. 2015.